It continues to be a bazillion degrees here and I’m still Miss Crankypants. I guess not every book I order can be the pot of gold at the end of the rainbow but I wanted to tell you what not to buy. The book in question is called ” Driving in Europe 101″ [amtap amazon:asin=1599754894] This is one instance where the product description on Amazon is better written and more informative than the actual product. The book itself promises “Your fun and easy guide to planning a driving vacation through Europe” and “Everything you will need to know to take that driving vacation through Europe including planning suggestions, to-do lists, document requirements and conversion tables..” and “With the clear explanations and expert advice in this friendly guide , you will discover just how easy it is to drive the streets of European countries”. 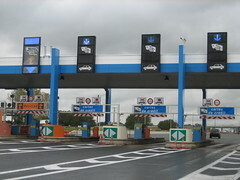 “Most of the limited access roads (Autostrada) are toll roads. You pay with cash or with a major credit card. Like an ATM , you will have to read or hear instructions from the tollbooth credit card machine in Italian. Unlike an ATM, there will probably be a long line of impatient people behind you. Cash and a pleasant smile may get you through the toll gates most expeditiously, but plastic is always an option if short on cash”. So after reading that I basically went from mildly anxious to completely petrified at the thought of enormous queues of irate Italians piling up behind us while we desperately try to figure out mysterious spoken Italian instructions. I think in this case, denial was actually better. You know, I hate to knock the little guys but “Driving in Europe 101” is a self-published type book and it really shows. It really needed much better editing and there simply isn’t enough worth while content in it. Despite the translations into European languages of obscure excuses used by drivers involved in unusual accidents, the humour of the book fell sadly flat in my opinion. At first I thought the book was a bit on the smarmy side but then after going back and reading it from the beginning I decided it was down right patronising. For example on the very first page of the introduction, Bowman says. “Pull your son’s globe of the shelf. That’s the big-ball-thingie you purchased thinking your son would absorb geographic knowledge by osmosis if you simply put it by his bed”. If I’d read that first page in the book store I would have put the book right back on the shelf where it belonged. Save your money and make a donation to Wikipedia instead.